Born in Arta ca. 1470, Michael Trivolis came from a well-to-do family from the Peloponnese who also gave birth to the Patriarch Saint Calistus I. 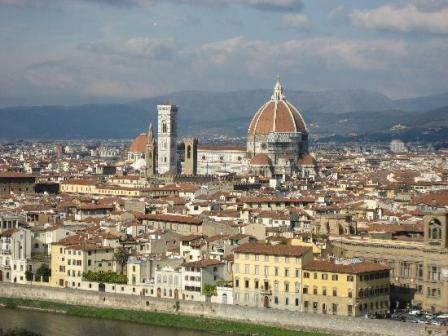 In his early youth he left for Italy where he completed his studies at Florence after which he took a keen interest in religion and spiritual renewal. 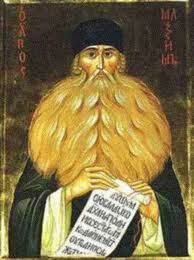 In 1507 he became a monk at the Monastery of Vatopedi in Greece and received the name Maximos. Much of his time was devoted to study and meditation and after ten years (1516), he was sent to Russia in response to the request of Grand Prince Basil Ivanovich. He was given the task of translating Christian writings as well as countering the heresy of Judaism. The Tatar invasions of Russia had depleted Russian conscience, leaving Russians in a state of ignorance. St Maximos played a vital role in reviving the hearts and minds of the Russians with his preaching. He became caught up in various controversies: about monastic possessions; over the Slavonic translation of the Canon Law; because of treasonable relations; and condemned for heresy by a church court (1525). 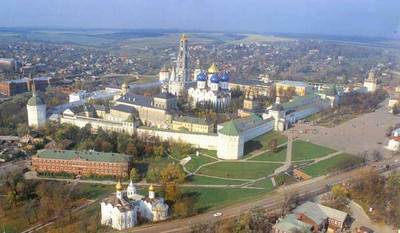 Eventually he was banished to the Monastery of Volokolamsk where he was forced to live a martyr’s life. He suffered from hunger, extreme cold, torment from enemies, deprivation from Holy Communion and books. Receiving consolation from an angel while imprisoned he gave thanks to God by composing a poetical canon in honour of the Holy Spirit. In 1531 he was brought to trial for having defended the primacy of the see of Constantinople over that of the Russian Church, for which he was sent to a monastery in Tver and condemned to perpetual imprisonment (1531-1551). In 1551 he was released after the sovereign replied favourably to the requests of pious boyars and those of the Abbot of the Trinity-St Sergius Lavra. He was eventually transferred to the Lavra where he enjoyed greater liberty and continued with his literary production until his strength was exhausted. Tzar Ivan IV recruited Saint Maximos to refute the Calvanist heresy brought into Russia by Matthew Baskin and the Saint responded by composing an admirable refutation which he sent to the council – this marked his final work for the church. 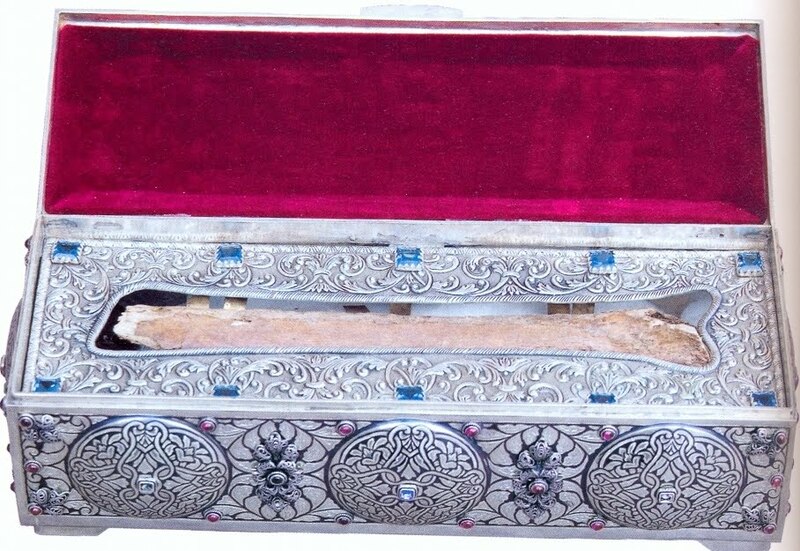 He fell asleep in the Lord at the age of eighty-six, on 21 January 1556. Soon after his death he was recognised and venerated as a holy Martyr and ‘Enlightener of Russia’. Arta had fallen to the Turks some twenty years before the birth of St Maximos and at about the age of ten his family moved to Corfu. He received basic education at the schools of Arta and Corfu and about the age of twenty he moved to Italy where he underwent higher studies for around fifteen years at the universities of Venice, Padua, Ferrara, Florence and Milan. He spent three years in Florence which then was the leading centre of Greek studies in Europe and his vocation as a scholar was shaped by the Greek philologist John Lascaris and by the influence of the Platonist Marsilio Ficino. He spent several years studying ancient Greek and Latin literature in Renaissance Italy at the height of its humanist achievement. 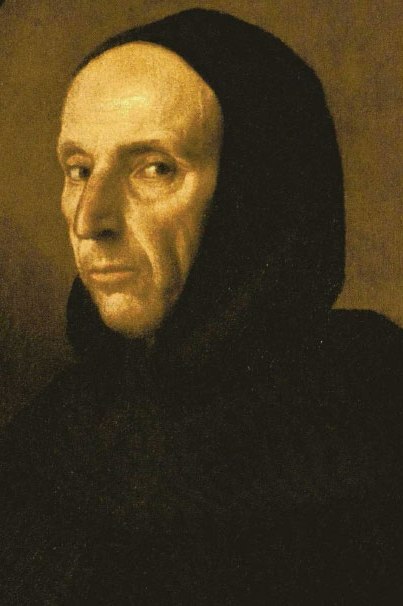 Another important influence on St Maximos was the Dominican friar Savonarola so much so that he wrote for the Russians a detailed account of Savonarola’s life which included his Lenten sermons, his conflict with the Pope and his execution in Florence. He praised him as a man “filled with every kind of wisdom” and was influenced by the Italian friar in relation to his concern with “moral problems, on his love for poverty and perhaps too on his outspokenness and courage in adversity”. In 1496 he went to Venice where he remained there for two years during which time he became associated with Aldus Manutius who was producing editions of the Greek classics. Obolensky states that he may have been employed in the Aldine Press, and that he worked on the edition of Aristotle which Aldus was preparing in Venice. His scholarly inclinations are evident in a letter dated 1498 where he mentions several offers of lucrative employment which he received. He also worked for Gianfrancesco Pico della Mirandola who was a distinguished Hellenist. Mirandola had a major influence on Maximos. Besides being a classical scholar he was a true ἑλληνομανής, as the Saint had once wrote, but he was also a “convinced Christian, a student of patristic writings, and a great admirer of Savonarola”. 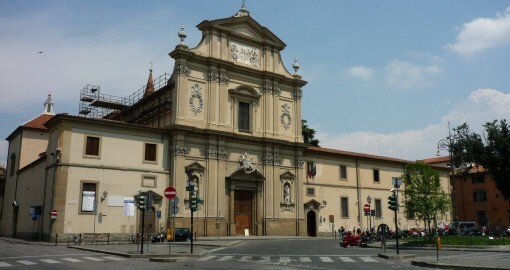 There is a chronicle in the monastery of San Marco in Florence which states that St Maximos was professed as a monk of that monastery in 1502, however, his career as a Dominican was brief. He had written to a friend in 1504 saying that he abandoned the monastic life. A time of his life which he describes as quite distressing. Denissoff, who published the letter concluded that he “was deliberately vague as to the reasons for the apparent collapse of his religious vocation”. In 1507 we find Michael as the monk Maximos in the monastery of Vatopedi on Mount Athos. Maximos severely criticized many Latin beliefs and practices which he denounced as heretical in his Russian writings. Among the beliefs he condemned was the doctrine of the Filioque which, was the main point of dispute between the Greek and the Latin churches since the 9th century. He also condemned the claim of universal jurisdiction by the Pope. His criticism on the whole was “measured and courteous, and lacked the emotional overtones of the anti-Latin pronouncements of many of his contemporaries”. An embassy from the Muscovite ruler, Basil III arrived on Mount Athos in 1516 for the purpose of recruiting a competent Greek translator. Few Russians were capable of reading the manuscripts brought from Byzantium and there was need for an expert to translate them into Slavonic. Prince Andreas Kurbsky, an illustrious scholar of the 16th century and a student of Maximos wrote that Russians languished from spiritual hunger. Ritualism, Pharisaism, occultism and astrology pervaded Russian society. Due to political events in Russia and her occupation by the barbaric Tatars, as well as the conquest of Constantinople by the Turks in 1453, ties between Moscow and Constantinople were severely weakened. Compounded with other socio-economic factors, Russian society and the church found themselves in a state of moral and spiritual corruption. Therefore, by the late fifteenth and early sixteenth centuries, Russia was going through a very dark period. Maximos arrived in Moscow in 1518 and his first task was to translate patristic commentaries on the Psalter. The motive behind this translation was to fight against the heresy of the ‘Judaizers’ which gained powerful support in government and church circles. The Judaizers were eventually exterminated by a militant group led by Joseph who was the abbot of the monastery of Volokolamsk. A study published in 1969 by the Soviet scholar Aleksey Ivanov, listed and described 365 works attributable to Maximos which, covered topics ranging from Theology, secular philosophy, statecraft and social problems. Maximos was also responsible for works on grammar and lexicography as well as the revision of the existing Slavonic texts of the Scriptures and liturgical books. Two different types of monasticism were prevalent in Russia during the late middle ages. Firstly, the large coenobitic house, owning land, practising works of charity and involved in administrative and economic activity which came to be known as ‘Josephian’. Secondly, those groups of small hermitages found in forests, known as lavrai in Greek and skity in Russian. Their monks led by Vassian Patrikeev, objected to landowning and also urged that heretics should be treated leniently. Vassian was also responsible for a new edition of the Nomocanon, the Orthodox manual of canon law in which he demonstrated that monasteries which owned land estates were violating canon law. Maximos took the side of the ‘Non-Possessors’ and was eventually asked to arbitrate on the meaning of the word προάστεια which had a broader connotation in the original translation of the Nomocanon. However, the translation incorporated by Vassian into his edition, was narrower and was supported by the ‘Non-Possessors’. 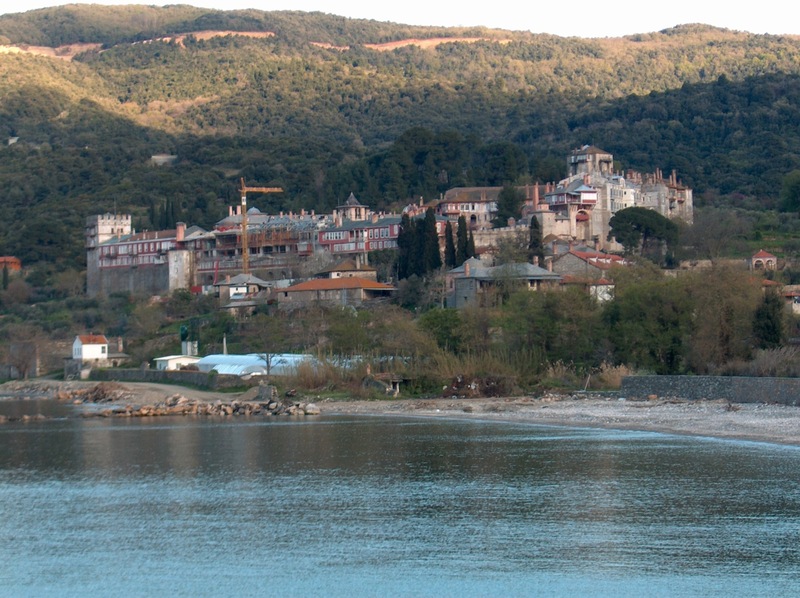 Vassian posed further problems for Maximos which were compounded by Maximos himself after many of his writings concerning the monasteries of Mount Athos, were frowned upon by the ‘Josephians’. In 1522 the leader of the ‘Possessors’, Daniel, abbot of Volokolamsk a disciple of Joseph, was appointed primate of the Russian Church, which marked the beginning of Maximos’ downfall. Moreover, as Geanakoplos states, Maximos became troubled because of the miserable conditions and inequities of Russian life and society so much so that he began to assume for himself role of critic of the Russian church and society. Maximos censured clergy, monastics and political representatives because of moral laxity as well as for inappropriate behaviour towards the people. Maximos was arrested in 1524/5 and tried by a court presided over by the Grand Prince Basil III and by Metropolitan Daniel of Moscow. In what was a biased trial, Maximos was sentenced to solitary confinement in the Volokolamsk monastery which was the stronghold of the ‘Possessors’. He was put in chains, excommunicated and was forbidden to read and write – an imprisonment which lasted for twenty-six years. 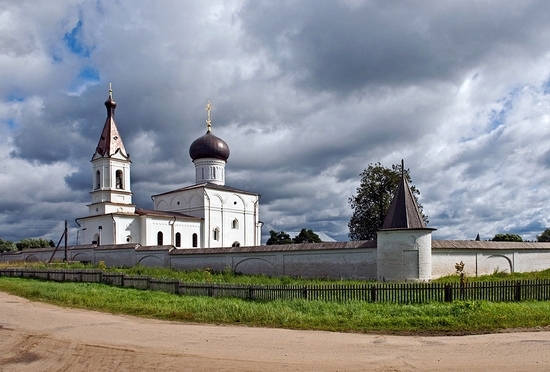 Because of his refusal to confess to the charges, he was tried again in 1531 and was sentenced to imprisonment in a monastery in Tver (pictured below). The list of charges included: “heretical views, practicing sorcery, criticizing the grand prince, having treasonable relations with the Turkish government, claiming that the Russian Church’s independence from the patriarchate of Constantinople was illegal, and denouncing the monasteries and the Church for owning land peasants”. According to Obolensky, the allegation of sorcery was unfounded and equally unjust was the accusation of heresy. Maximos denied that he ever criticized the grand prince – an accusation which was never proven. With reference to the treasonable relations with the Ottoman empire which he was accused of, these too could not be proven. The last two charges were in fact accurate and Maximos remained outspoken on his belief that the Russian church should return to the obedience of its mother-Church and that monasteries should not own land. It is highly probable that Maximos’ condemnation of monastic landownership was the main reason for the severity of his sentence. Maximos was eventually allowed to read and write books due to the compassion of the local Bishop Akakiy. There were failed attempts in 1540 by the patriarchs of Constantinople and Alexandria writing to Ivan IV requesting his release;  whilst Maximos himself repeatedly begged his jailers to let him return to Mount Athos. It was only in the last few years of Maximos’ life, about 1551, that he was released where he was allowed to live in St Sergius’ monastery of the Holy Trinity near Moscow. He suffered much from the burdensome bonds and the long confinement in a frightful prison, …being exceedingly beleaguered and mercilessly tortured, both physically and mentally, by intolerable ordeals for six years in iron fetters. …As a result of these tortures, St. Maximos would often fall completely unconscious, almost to the point of death. At one point, wishing to alleviate his affliction, he wrote a Canon to the Holy Spirit on the prison wall with a piece of charcoal, since he was not permitted paper on which to write. Under these conditions, he never grumbled or condemned anyone! At the end of his earthly life, St. Maximos would write a letter in which he prayed with regard to Metropolitan Daniel, who was the primary cause of his myriads of tortures: ‘May God not lay this sin to his charge’! I ask that you vouchsafe me to partake of the All-Immaculate and Live-giving Mysteries of Christ, which I have been denied for seventeen years now. …Grant me, I beseech you, this favor…, save this lost soul….” “…I seek mercy and benevolence….” “… I ask for mercy; show me mercy, that you might also be vouchsafed the same Grace. But I tell you in this regard that you have [unjustly] condemned me for heresy and prohibited me from partaking of the Divine Mysteries. As for my other many and innumerable sins, I am not able to open my mouth. I must not despair, however, but rather hope in God’s immeasurable mercy…. He died in the Trinity monastery at the age of almost ninety and because of his extraordinary patience, enduring twenty-six years of cruel torments he came to be revered as a saint. About 100 years after his death the patriarch Nikon agreed to his canonization, which was authorized by the patriarchates of both Moscow and Constantinople in 1988. Maximos was an outstanding scholar with an excellent training in ancient philosophy. He played an important role in the controversies that arose in sixteenth-century Russia. Obolensky states that Maximos was one of the last personalities who exemplified the Byzantine spirit and heritage. He persisted until death in the work which he had undertaken i.e. that of raising the spiritual level of the Russian church and people, always in accord with Orthodox Byzantine theology, morality, and tradition. Billington numbers Maximos among four other influential Russians who “reproduced on Russian soil the philosophic opposition to both superstition and scholasticism that was characteristic of Western humanism”. He was the first to introduce modern scientific, philological methods to Russia and his works on grammar and lexicography were later published by Moscow’s printing press and became before long authoritative texts in Russia. 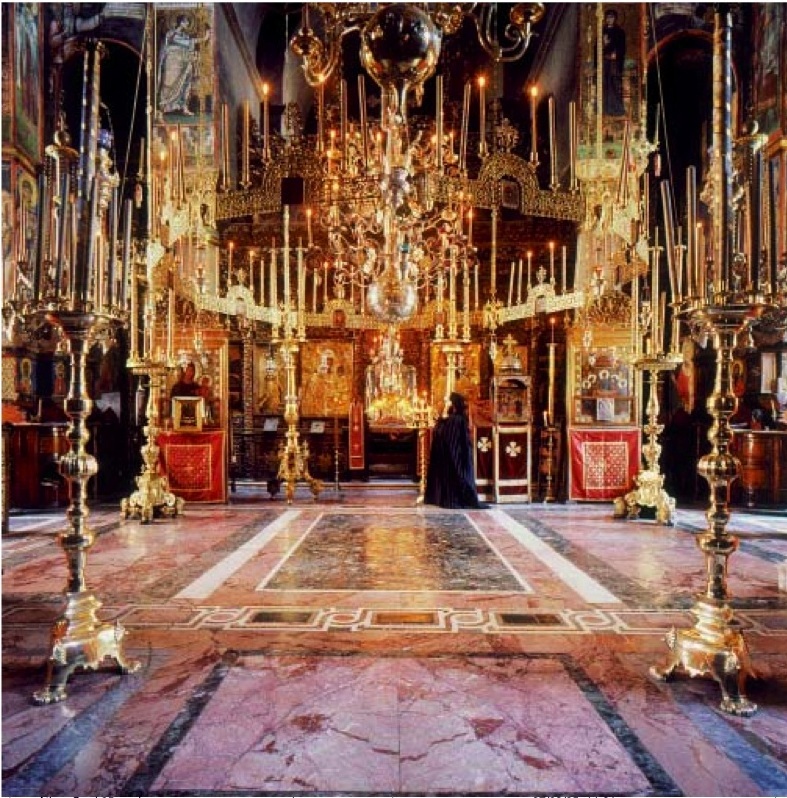 Geanakoplos believes that Maximos not only helped to revitalize Orthodoxy in Russia, but his work also led “to the gradual recovery and strengthening of the virtually broken link between the patriarchate of Constantinople and Russia”. There is also good reason to believe that his writings influenced the ecclesiastical reforms at the Stoglav Council of 1551, and the seventeenth century patriarch Nikon who affirmed: “I am Russian, but my faith and religion are Greek”. Whilst it can be argued that Maximos’ influence on Russian ecclesiastical life was greater felt after his death, it is evident that many prominent leaders of his time received his letters and responded to them, and therefore would have been affected by his thinking. Others such as the modern Western scholar Mack Haney believe that Maximos “influenced only the fringe elements of Russian society”. Whatever the case may be, St Maximos wrote 365 books, of which 163 remain unpublished, thus his legacy of literary and theological works was significant. He initiated the Russian people into ancient Greek philosophy and literature and was the first to introduce the art of printing into Russia due to his connection with the Italian typographer Aldus Manutius. He was around eighty-six years old when he reposed in 1556, and had served the Russian Church and its pious faithful for a total of thirty-eight years, twenty-six of which he had spent in prison. Drosos, (Fr.) Nektarios. ‘Maximos the Greek, St’. In Encyclopedia of Greece and the Hellenic Tradition. Volume 2 L-Z. Edited by Graham Speake. London: Fitzroy Dearborn Publishers, 2000. (Archimandrite) Ephraim. An Indomitable Herald of Patristic Tradition. 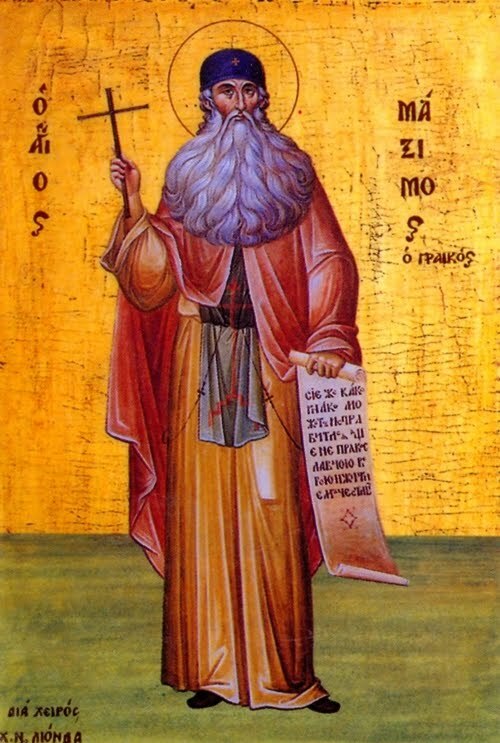 MYSTAGOGY: The Weblog Of John Sanidopoulos at http://www.johnsanidopoulos.com/2011/01/saint-maximos-greek-of-vatopaidi.html. Accessed 04 March 2011. ΦΕΙΔΑΣ, Ι. ‘Μἀξιμος’. ΘΡΗΣΚΕΥΤΙΚΗ ΚΑΙ ΗΘΙΚΗ ΕΓΚΥΚΛΟΠΕΔΙΑ. 8ΟΣ ΤΟΜΟΣ. ΑΘΗΝΑΙ: ΠΑΝΕΠΙΣΤΗΜΙΟΥ, 1966. Geanakoplos, Deno. J. ‘The Post-Byzantine Athonite Monk Maximos “the Greek”: Reformer of Orthodoxy in Sixteenth-Century Muscovy’. Greek Orthodox Theological Review 33 (1988): 445-468. Haney, Jack V. From Italy to Muscovy : the life and works of Maxim the Greek. Munich : 1973. HieroMonk Makarios, The Synaxarion: The Lives of the Saints of the Orthodox Church. Vol. Three January, February. Ormylia: Holy Convent of The Annunciation of Our Lady, 2001. 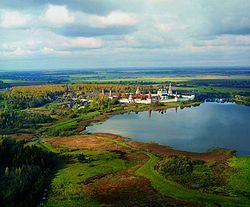 Obolensky, Dimitri. Six Byzantine Portraits. Oxford: Clarendon Press, 1988. Pospielovsky, Dimitry. The Orthodox Church in the History of Russia. Crestwood, NY: St Vladimir’s Seminary Press, 1998. The capital of the Greek province of Epirus. He is also known as Maximus Vatopedinos and in Russian as Maxim. Being a highly learned educator he was also referred to as the “Enlightener of the Russians”. C.f. Fr. Nektarios Drosos, ‘Maximos the Greek, St’, in Encyclopedia of Greece and the Hellenic Tradition. Volume 2 L-Z (London: Fitzroy Dearborn Publishers, 2000), 1018-1020. HieroMonk Makarios, op. cit., 250. HieroMonk Makarios, op. cit., 251. HieroMonk Makarios, op. cit., 251. He wrote the canon after he was gifted with a vision of a Holy Angel, who descended into his prison cell and offered him Holy Communion. C.f. Archimandrite Ephraim. An Indomitable Herald of Patristic Tradition. MYSTAGOGY: The Weblog Of John Sanidopoulos at http://www.johnsanidopoulos.com/2011/01/saint-maximos-greek-of-vatopaidi.html. Accessed 04 March 2011. HieroMonk Makarios, op. cit., 252. HieroMonk Makarios, op. cit., 252. It was only in 1998 that the Patriarchate of Moscow added his name to the calendar of Saints. Archimandrite Ephraim. An Indomitable Herald of Patristic Tradition. 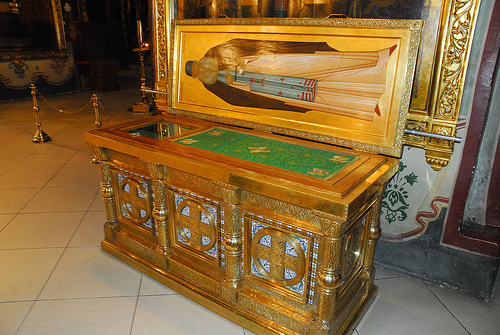 MYSTAGOGY: The Weblog Of John Sanidopoulos at http://www.johnsanidopoulos.com/2011/01/saint-maximos-greek-of-vatopaidi.html. Accessed 04 March 2011. His philological knowledge as we shall see was also complemented on Mount Athos by his intensive occupation with the Church Fathers. Deno. J Geanakoplos, ‘The Post-Byzantine Athonite Monk Maximos “the Greek”: Reformer of Orthodoxy in Sixteenth-Century Muscovy’, Greek Orthodox Theological Review 33 (1988): 447-448. Geanakoplos writes that Maximos may have been dissatisfied with the “secular Italian humanist attitudes and mode of life – not to underrate his always intense attraction to the Orthodox monastic life”. Geanakoplos, op. cit., 448. A plausible explanation is related by Archimandrite Ephraim: “St. Maximos, however, gave himself over to an intense search for authentic way of Christian life, having seen for himself the nakedness of humankind bereft of God’s Grace while living in Italy, where Renaissance humanism was then flourishing.” Archimandrite Ephraim, op. cit.. Along similar lines Pospielovksy writes Maximos was “disappointed in Roman Catholicism, he returned to Orthodoxy, became a monk on Mt Athos, and even wrote several polemical tracts against the Latins.” Dimitry Pospielovsky, The Orthodox Church in the History of Russia (Crestwood, NY: St Vladimir’s Seminary Press, 1998), 64. Obolensky, op. cit., 204. C.f. E. Denissoff, Maxime le Grec et l’Occident: Contribution a l’histoire de la penmsee religieuse et philosophique de Michel Trivolis (Paris-Louvain, 1942). It may very well have been because of the monstery’s rich Athonite manuscript library of Greek church fathers and ecclesiastical writings that he chose it. C.f. Geanakoplos, op. cit., 448. Mostly Greek epitaphs in verse. Fr Drosos points out that “Russian sources do not explain clearly why Maximos was sent to Russia, though they state that he went there to seek contributions for his monastery. This is endorsed by his subsequent adversary, Bishop Daniel, who said that Maximos went ‘to beg for alms‘, because he asked Vasiliy not to forget the penury of the Holy Monastery of Vatopedi.” Fr Drosos, op. cit., 1018. Maximos was recommended by his Abbot as follows in his letter to the metropolitan of Moscow: “our most honourable brother Maximos…, proficient in divine Scripture and adept in interpreting all kinds of books, both ecclesiastical and those called Hellenic [i.e. secular], because from his early youth he has grown up in them and learned [to understand] them through the practise of virtue, and not simply by reading them often, as others do.” According to Obolensky, Maximos knew no Russian upon his arrival – he learnt the language soon after his arrival. Obolensky, op. cit., 208. However, Geanakoplos points out that several scholars think he may have learned a bit on the long trip to Moscow. C.f. Geanakoplos, op. cit., 451. Fr Drosos, op. cit., 1019. Maximos’ writings also bear witness to his shock at the superstitious tendencies of the Russian people. For instance, Russians refused to bury bodies that had drowned or had died as a result of violence for fear that their bodies would make the soil infertile. C.f. Geanakoplos, op. cit., 463. The manner in which he performed his task involved translating the Greek into Latin, which his Russian colleagues then translated into Slavonic. This was an error prone procedure which resulted in errors. Mistakes which Obolensky states that Maximos would pay for dearly. C.f. Obolensky, op. cit., 209. At that time the Psalter was not only important for the church but also in the social and educational life of Russia. It was used in the primary schools as a tool for reading. One of the texts which the ‘Judaizers’ used to support their teaching was the Book of Psalms. Early translations included scribal errors which were heretical which Maximos corrected. Obolensky, op. cit., 211. After the name of Joseph, abbot of Volokolamsk, the leader of the hard-liners who wanted all heretics killed. “Previous Russian translators had taken the word to mean ‘villages with resident peasants’… Maxim, on the other hand, assured Vassian that the true meaning of προάστεια was ‘ploughed fields and vineyards’” Obolensky, op. cit., 213. Vassian was prone to exaggeration which worsened relations with the ‘Josephians’. For instance he said that “All our books are false ones, and were written by the devil and not by the Holy Spirit . Until Maxim we used these books to blaspheme God, and not to glorify or pray to him.” Obolensky, op. cit., 213. Geanakoplos, op. cit., 452. Geanakoplos describes Maximos as one having a critical mind with a restless and intemperate personality, which led to him becoming eventually condemnatory in his speech and in the letters he sent to various officials. C.f. Geanakoplos, op. cit., 454. It must be noted that some of Maximos’ translations had grammatical errors which led to the accusation of heresy. These mistakes were due to his inadequate knowledge of the Russian language. Maximos, however was in fact to some degree frustrated with the Muscovite government. Obolensky writes that “as a Greek, Maxim hoped that one day the Muscovite sovereign, the most powerful Orthodox ruler on earth, would come to the help of his enslaved people and liberate them from the infidel yoke. A war between Russia and the Ottoman Empire was a necessary prelude to the liberation of the Christians of the Balkans.” Obolensky, op. cit., 215. Geanakoplos writes that “the xenophobic prince and no less xenophobic metropolitans and boyars, would not accede to the Patriarch’s request. In view of the Russian ecclesiastical and political authorities, Maximos was probably considered not only a dangerous, even subversive, critic of Russian government, society, and the church, but an official representative of the Patriarch of Constantinople – a leader, Russian eyes, of a now generally mistrusted Greek Orthodox church”. Geanakoplos, op. cit., 457-458. Billington writes that “Far from showing bitterness toward the ungrateful land to which he had come, he developed a love of Russia, and an image of it different from that of the bombastic Josephite monks in the Tsar’s entourage.” James H. Billington, The Icon and The Axe: An Interpretive History of Russian Culture (New York: Vintage Books, 1970), 93. Obolensky, op. cit., 217. In subsequent generations a statue of Maximos was erected at the Russian theological school at Zagorsk near Moscow. Fr Drosos, op. cit., 1019. To name a few: Boyar who frequently visited Maximos in his cell; Metropolitan Iosaaf; Abbot Artemius; also members of the imperial court. Geanakoplos, goes so far as to say that “because of the ultimate success of much of his work in Russia, Maximos, I believe, should be regarded as one of the greatest Orthodox reformers of the Slavic Orthodox world, perhaps second only in importance to Cyril and Methodius”. Geanakoplos, op. cit., 467. Though such statements may come across as exaggerated, Geanakoplos argues convincingly in favour of Maximos’ intense contribution to Russian society. Pospielovksy supports such statements writing that: “as he [Maximos] was undoubtedly the best and most erudite scholar in Russia at the time, his monastic apartment became an intellectual salon of the Moscow elite. Thus his ideas, which were not to the liking of the possessors, became influential.” Pospielovsky, op. cit., 64. A sample of his works include the Apostolic Canons; the canons of ecumenical and local councils collected and interpreted by Matthew Vlastares; the homilies of St John Chrysostom; the Gospels of Matthew and John; Symeon Metaphrastes’ Life of the Theotokos; the life of Dionysius the Areopagite. In terms of corrections he made to liturgical books the list includes: Triodion; Horologion; liturgical Gospel; Menaion. C.f. Ι. ΦΕΙΔΑΣ, ‘Μἀξιμος’, ΘΡΗΣΚΕΥΤΙΚΗ ΚΑΙ ΗΘΙΚΗ ΕΓΚΥΚΛΟΠΕΔΙΑ 8ΟΣ ΤΟΜΟΣ (ΑΘΗΝΑΙ: ΠΑΝΕΠΙΣΤΗΜΙΟΥ, 1966), 629. Fantatic article. It’s a loss for orthodoxy that he is not better known as other Fathers of the church. According to the article he was not only an important contributor to Orthodoxy in Russia but a reformer. Without his intervention western humanist notions would have prevailed in Russia and in turn deprive them of immense spiritual wealth. May St Maximos the Greek intercede for me the sinner. Good summary point, glad you enjoyed the read, thank you for the feedback. I agree with Jim! I have just become aquatinted with St. Maximos mostly through a quick listen of Ancient Faith Radio’s “Saint of the Day” I have been looking for some writings of his in particular the ones refrenced below off the web site are you familar with them and do you know weather they might be translated into english? I’m not familiar with any other of his writings translated in English. As you know, there is a broad patristic bibliography from Patrologea Greca that has not been translated into English as yet. Best Wishes.